Who ruled India and Pakistan after independence? India became independent in 1946. 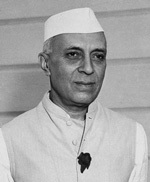 Jawaharlal Nehru, the son of a powerful Congress leader, was the first Prime Minister of India. Liaquat Ali Khan was the first Prime Minister of Pakistan. Why did India and Pakistan split into two countries? What about Kashmir, the border zone? India and Pakistan didn’t agree on where the border should be between them. They kept fighting over Kashmir and north-western Pakistan. That’s a big mountainous area between India, China, Afghanistan, and Pakistan. Kashmir and north-west Pakistan didn’t care who was ruling. They answered only to local rulers – and mostly they still do. Who were India and Pakistan’s allies? Both countries looked for help from more powerful countries. India (like its neighbors Afghanistan and Iran) started to get help from Russia. Pakistan got help from the United States. So, like Russia, India followed more socialist policies. The government owned or controlled a lot of businesses. But Pakistan tried to be more like the United States. Pakistan took a more capitalist path. Most of its rulers came from the military. By 1954, Pakistan was under martial law. 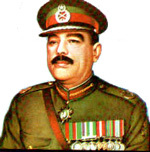 The general Ayub Khan took power in 1958. Nehru died in 1964 with no sons. So his daughter, Indira Gandhi, almost immediately succeeded him. 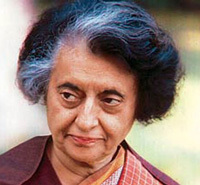 Indira Gandhi held power in India until 1984. Her power reflects the influence of Central Asian, Communist feminism. She continued her father’s policy of being allied with Russia. And she kept on taking state money to make their own family and friends richer. In 1971, with Indira Gandhi’s support, East Pakistan fought a war to become an independent country, Bangladesh. Bangladesh wanted to be more socialist than Pakistan – more like India. At first Bangladesh was very poor, and there were famines, but soon that started to change. At the same time, the socialist People’s Party also took power in Pakistan under Zulfikar Ali Bhutto on the promise of redistribution of land. Why do people want redistribution of land? Pakistan began to move away from the United States and closer to Russia and China. When army generals killed Bhutto in 1979, his daughter Benazir Bhutto took over in 1988. Struggles continued between the army generals (mostly favoring the United States) and the socialist party. In 1984, Indira Gandhi’s own Sikh bodyguards killed her. Her son Rajiv Gandhi took power. As the Soviet Union collapsed, Rajiv turned India’s alliance from Russia to the United States. He changed to more capitalist policies. These policies led to rapid economic growth, but also growing inequality. The rich got richer and the poor got poorer. But a Tamil independence fighter killed Rajiv in 1991. For the next twenty years, more conservative Hindu politicians – also capitalists, but capitalists who favored Hindus over Sikhs, Muslims, Christians, and Parsees – struggled to get control of India. India and Pakistan were always threatening to fight each other, and they both really wanted to have nuclear bombs in order to be stronger and bigger threats. With both India and Pakistan strongly influenced by conservatives and the United States, they worked seriously on the bombs. About 1998, both India and Pakistan developed nuclear bombs. Neither country has used them – yet. But in 2004 Rajiv’s widow, Sonia Gandhi, won an election. She didn’t rule herself, but left power to her ally Manmohan Singh, a Sikh. Then in 2014, the Hindu conservatives won a sweeping victory in the elections. For now, the Gandhi family is out of power again. Under Modi, India is getting richer, but more unequal and more sexist and racist. Things are even worse in Pakistan. 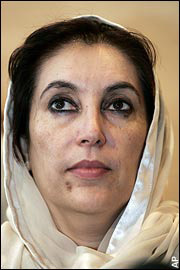 After Benazir Bhutto was killed in 2007, General Musharraf became unpopular and resigned. The government has become weaker and weaker, and more and more of Pakistan has fallen under the control of the Taliban or local clan leaders. Bangladesh has been doing relatively well. Since 1991, Bangladesh has had an elected democratic government, currently under Sheikh Hasina, and has been building schools and health clinics and roads. Sadly, all of this is threatened by global warming; Bangladesh will soon suffer from terrible floods caused by rising sea levels. Cite this page: Carr, K.E. Modern India, Pakistan, and Bangladesh. Quatr.us Study Guides, July 19, 2017. Web. April 25, 2019.